A group of eight historic objects from Tello seized in a Metropolitan Police raid are now going back to Iraq with the help of the British Museum. Excavating magical cones from the walls of the temple at Tello. In 2003, the Metropolitan Police raided a now defunct London antiquities dealer, seizing valuable objects that have since been identified at the British Museum as coming from the site of Tello in southern Iraq. The temple of the Sumerian god Ningirsu at Tello. 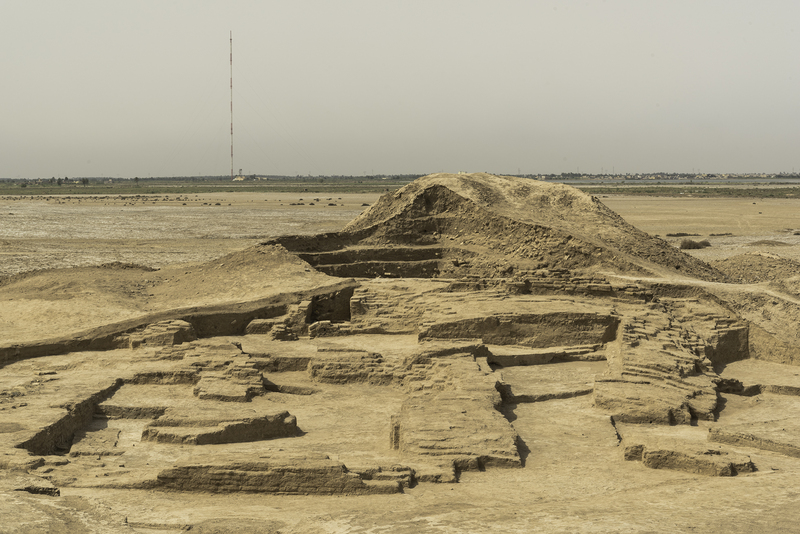 Tello, the modern Arabic name for the ancient Sumerian city of Girsu, is the southern site of the British Museum’s Iraq Emergency Heritage Management Training Scheme (Iraq Scheme), where the Museum has been conducting archaeological excavations since 2016. It is one of the earliest known cities of the world, revered in the 3rd millennium BC as the sanctuary of the Sumerian heroic god Ningirsu. In 2015–2016, a potential crime scene was recorded as part of an initial survey at Tello that consisted of dozens of shallow pits. 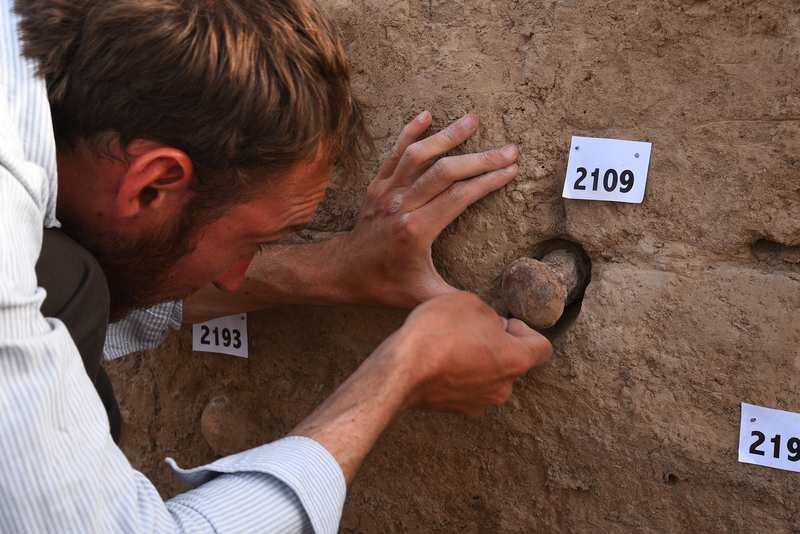 These pits can be traced back to a period of looting at this historical site at the beginning of 2003, with the missing objects likely transferred quickly for sale in London. They were seized in a police operation on 2 May 2003, when the dealer failed to supply proof of ownership, subsequently ceased trading and the objects passed to the Crown. They were recently brought to the British Museum for analysis by the Art & Antiques Unit of the Metropolitan Police. 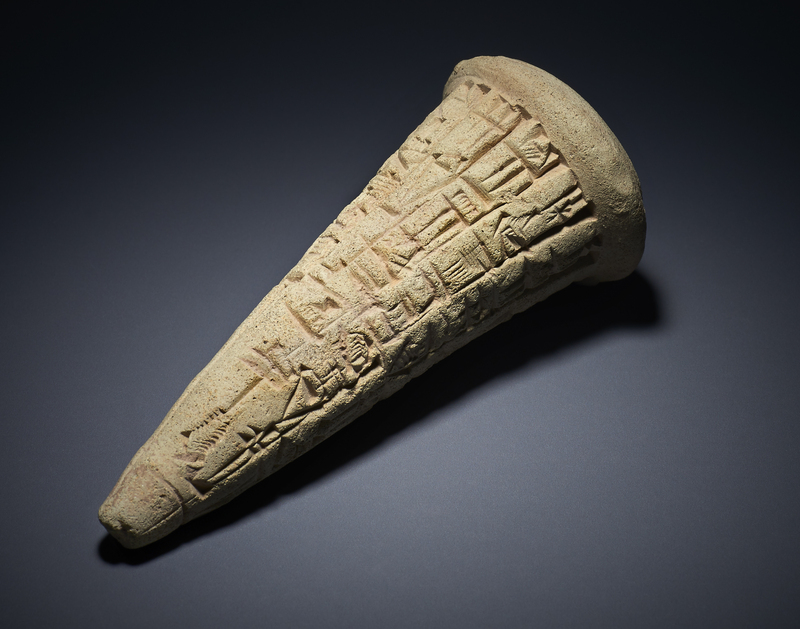 One of three votive cones being returned to Iraq. They are inscribed in ancient cuneiform script which helped British Museum experts identify them as originating from the site at Tello. Three of the objects are fired clay cones with Sumerian inscriptions in cuneiform script (a language formed by using small wedges to make up symbols) which identify their origin as the Eninnu temple, sacred to the god’s patron deity Ningirsu. The inscriptions read: ‘For Ningirsu, Enlil’s mighty warrior, Gudea, ruler of Lagash, made things function as they should (and) he built and restored for him his Eninnu, the White Thunderbird’. 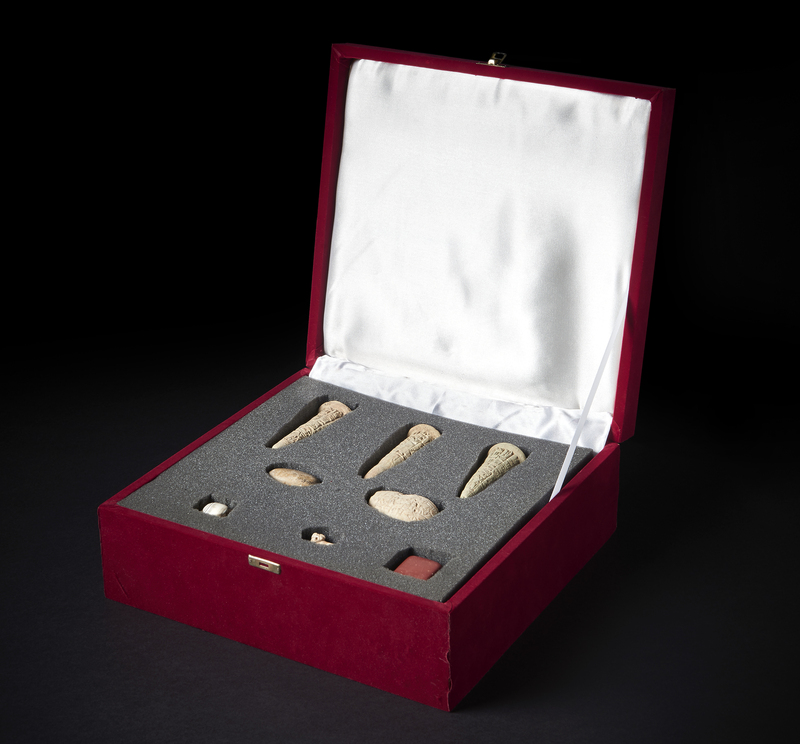 The other items consist of a broken gypsum mace-head with an Old Sumerian inscription, a polished river pebble with a cuneiform inscription, a white marble amulet pendant in the form of a reclining bull dating to the Jemdet Nasr period (c. 3000 BC), a red marble stamp seal or amulet pendant representing a pair of stylised animals, and a white chalcedony stamp seal which dates to the Achaemenid period (c. 550–330 BC). All of these resemble objects known from excavations at Tello and are therefore most likely to originate from the same site. Objects looted from the site of Tello in 2003 are being returned to Iraq. Recently, these objects were handed over to the Iraqi authorities at a small ceremony held at the British Museum, and will be returned to Baghdad where they are likely to go on display in the Iraq Museum. 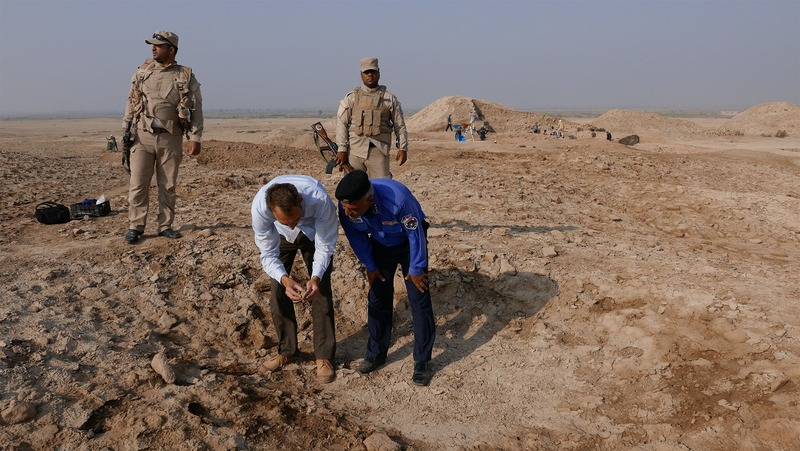 Sebastien Rey working with Iraqi state police in 2015 to identify areas of looting at Tello. The site of Tello is now protected and the ongoing British Museum excavations have not only recorded the old looting pits but are revealing the full plan of the Eninnu temple, reconstructing how the fired clay cones were originally set within its walls and the extent of the occupation there in other periods. Director of the British Museum, Hartwig Fischer, said, ‘The British Museum is absolutely committed to the fight against illicit trade and damage to cultural heritage. This is an issue which concerns us all. I am delighted that we are able to assist in the return of these important objects to Iraq, via the Embassy of the Republic of Iraq in London. It is a symbol of the very strong working relationships we have with our Iraqi colleagues, developed over many years and extended through the British Museum-run Iraq Scheme’. Find out more about the Museum’s work in Iraq, including the Iraq Emergency Heritage Management Training Scheme here.